dinner party: mailbag: to ham, or not to ham? I need a bit of help...I am planning a nice dinner party for the end of January. Three other couples will be there. I plan to make it formal (using china, etc.) and was thinking of serving ham but is that strange? Is ham for just Easter or the holidays or the springtime? I can't decide if I should do short ribs instead. Thank you for any advice. Do you have any suggestions for vegetables, etc.? Hmm...ham. 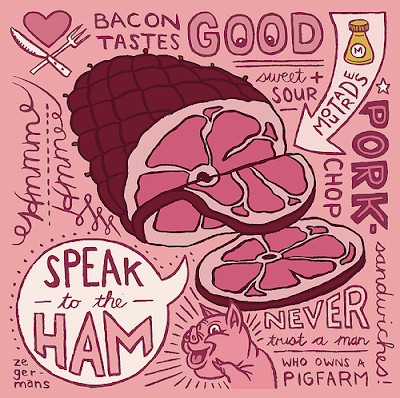 I think ham would be delicious--or short ribs, if you decide to go that route. Both are great choices for a big crowd because you can make them in advance. And I think those two proteins can be easily fancified for a formal meal, depending on what you serve with them. Or, if you decide to go the short ribs route, for my husband's birthday last year, I made short ribs braised in wine and dijon mustard and everyone loved them. They also really loved the celery root puree I served with them. Whatever you decide to do, I'm sure it will be wonderful. Does anyone else have thoughts on serving ham at non-holiday dinners? Is it weird or not? Or, if you have a dinner party quandary of your own, email me at lisadinnerpartyATgmailDOTcom. I think ham would be nice for a "fancy" dinner party because it's not something that people eat everyday. I've just started hosting dinner parties for my girlfriends and I love it. I need to get a bigger table! Your blog is an inspiration to my menus. ya know - I was at a pretty fancy restaurant last week & they had sliced ham on the menu. It was so unusual that we had to order it! They took it the Southern route: a meat & three plate with mac n' cheese, fried okra, biscuit, a smear of pimento cheese... it wasn't elegant, but it was fun and retro and we ate every bite! Carving (slicing?) the ham tableside could be a fancifying twist. cherries and slivered almonds we made for ham occasionally? Nikkilooch: My dinner table seats 4, so I feel your pain. We usually sit around the living room with plates on our laps. Not very elegant, but what can you do? Daniel: That is very true, if you have mad carving skills. Or an electric knife. Anonymom: Yes, I do. I think I ate it with a spoon. I love anything with cherries. I'm with you, Lisa. Serve the ham! Ham on its own is boring. Ham spiced up with all kinds of fancy little touches is awesome. I'm thinking chutney, lots of fun pickles, biscuits with fig preserves and butter, and brussels sprouts with onions and balsamic vinegar. And a salad. And a platter of sliced tomatoes, because really -- what's a ham dinner without sliced tomatoes? I like the pickled shrump idea too. Dan has electric knifing in his genes. Megan: Yes, you definitely need some fun condiments for ham. Otherwise, it's just a slab of meat. I love the fig preserves and butter idea. Good with spicy pepper jelly too! Don't forget the homemade mustard, too. I love ham, but those short ribs you made last year for Dan's birthday were divine!